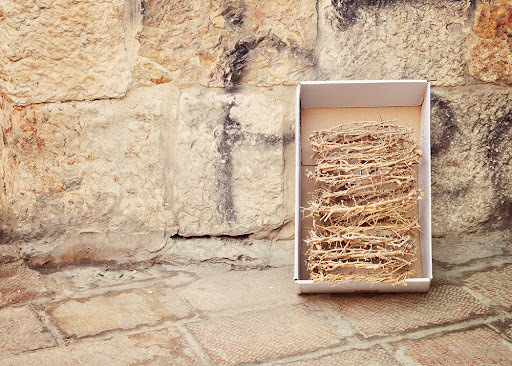 Thorny crowns on sale in the Christian Quarter of Jerusalem's Old City. I didn't see anyone actually buying one. Maybe the vendors hoped pilgrims would buy them to save for Easter time? The crown of thorns is always strange to me, but seeing a whole box of them like this is very strange. Eek! i think I'd run a mile from them! I've never seen one before, though the thorny plant/bush/tree? from which they are made was pointed out to us once when I was such a pilgrim touring your beautiful Israel. I think this is fascinating! ...and here's a thought. Some Christians might make them part of their Christmas decor. It is too easy to celebrate the baby without remembering the rest of the story. It's why some Christians hang a nail on their Christmas tree. no that is not something you see every day. I love the monochromatic color--it gives life to the variety of textures in the shot.